Use the TAKA Turmeric Golden Smoothie mix to supercharge your smoothies with the natural goodness of turmeric, coconut and specially selected superfoods. As well as supplementing fruit and green smoothies, the Golden Smoothie superblend is incredibly good over yoghurt, granola and breakfast cereals. Along with the stimulating synergy of turmeric and black pepper, this mildly spiced powder-mix features flaxseed, chia seeds, maca, and pinch of Himalayan pink salt. Nutty and nutritious, the flavour is truly awesome! Organic Turmeric 26%, Organic Ceylon Cinnamon, Flaxseed Powder 17%, Organic Coconut Milk Powder 16% (Organic Coconut Milk 97%, Organic Tapioca Maltodextrin [derived from Organic Yucca Root] & Organic Gum Acacia), Organic Chia Seeds 12%, Organic Maca, Organic Ginger, Himalayan Pink Salt, Organic Black Pepper. To make a tasty Golden Smoothie, add 1-2 teaspoons of this mix to your favourite smoothie or shake. Blend and enjoy. Good for all times of the day - work, sport or play. If you are new to turmeric, it is recommended to start with 1 teaspoon and to build up your dosage over time. TAKA Recommends: Adding to fruit or green smoothies. We love this mix blended with frozen banana, pineapple, dates and almond milk. Also great over oats or yoghurt. 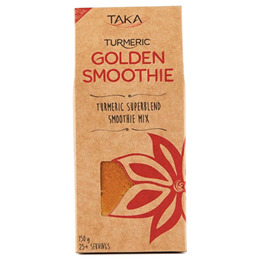 Below are reviews of TAKA Turmeric Golden Smoothie - 150g Powder by bodykind customers. If you have tried this product we'd love to hear what you think so please leave a review.